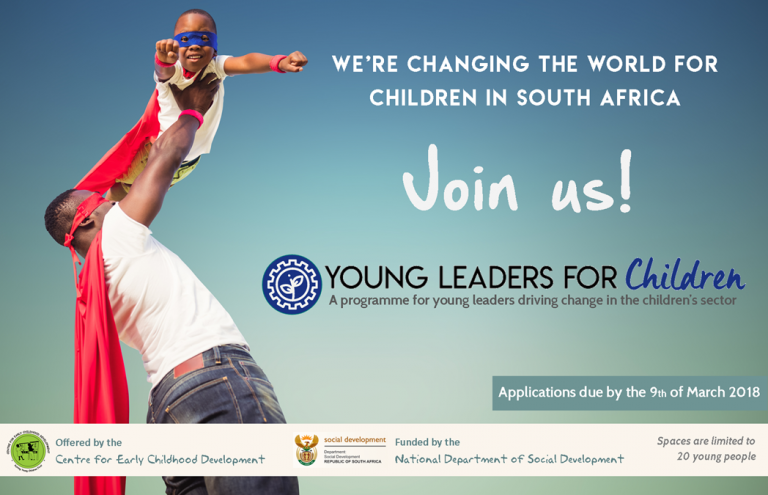 The YOUNG LEADERS FOR CHILDREN programme is a national year-long leadership programme. The aim is to empower emerging non-profit leaders in order to provide sustainable services to children in South Africa. We believe in the power of young people to bring about change. The programme consists of two blocks of one week each. The weeks will be filled with workshops, seminars and inspiring talks. The first block will take place in May and the second in September in Cape Town. The thread of leadership will run throughout each week’s activities. Each participant will be supported by a coach throughout the year. The programme is targeted at those who are managing projects or aspire to be in a management position. There are no programme fees involved in attending the YOUNG LEADERS FOR CHILDREN programme. Financial support towards travel and accommodation can be arranged. To apply, please follow the link to the application form: https://goo.gl/forms/00yPDuugg0vw4VZF3. Applications are due on the 9th of March at 16h00. For any queries, please contact me on jblom@cecd.org.za or 021 683 2420.